Cullen came through Leinster's youth system, representing both his club and Ireland at schools and age-grade levels. He won his first full Ireland cap in 2002 against New Zealand and made his first start in November the same year against Fiji. In 2005 he joined Guinness Premiership side Leicester, winning the Guinness Premiership and Anglo-Welsh Cup. 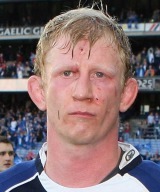 He returned to Leinster in 2007, winning the Magners League and captaining the province to the 2009 Heineken Cup title. He was recalled to international action in 2009 and covered for the injured Donncha O'Callaghan in the opening games of the 2010 Six Nations. He took the 2011 Heineken Cup with Leinster and went on to captain Ireland in their first World Cup warm-up Test against Scotland. After skippering an Irish second-string side against Connacht, Cullen was named in the 30-man squad for the World Cup. Cullen played for Ireland during the competition against Russia but it proved to be his only outing in the tournament. He returned to Leinster after the tournament and helped guide them to the final of the 2011-12 Heineken Cup.